Recognize is an integrated employee recognition system that offers SMBs a single platform from which to engage with employees and recognize their contribution. Incorporating automatic employee anniversary recognition, on-the-spot social employee recognition and nomination voting, Recognize aims to deliver a smart employee recognition solution. Designed to promote a positive company culture, Recognize equips users with different employee recognition tools including social gamification, service anniversaries and rewards as well as awards and nominations. In order to manage rewards effectively, Recognize enables users to create their own rewards catalog complete with experiences which employees can redeem with points. Besides rewards, users can create certificates of recognition, produce badges of recognition and send employees text messages of recognition easily. To enhance user productivity, Recognize supports a number of integrations including Outlook, Yammer, Sharepoint and Azure. By supporting such third party integrations, users can utilize single sign on, import user spreadsheets alongside user data simply and efficiently. Moreover, since users can sign into Office 365, Slack and Google Apps automatically, Recognize enables users to access their platform quickly and conveniently from their specific work account. Recognize is also available as a native mobile application for iOS and Android, thereby granting users the flexibility to view company recognitions and redeem rewards on the move from any smartphone device. It has pretty simplistic reporting capabilities and the info is not always clean (employees aren't always in the department/teams they should be in). Thanks for the review! Let us know what type of reporting you need and we can investigate. We build custom reports for customers, such as our latest engagement reports by roles. For user management, we recommend the sFTP, Azure AD, or Yammer user sync as that keeps users data up to date automatically every night. Recognize has taken our internal recognition program to new heights and offered a fun way to reward staff for the hard work that they do. This software is very easy to use and the support team is extremely responsive. This software is very easy to use and the support team is extremely responsive. There are parts of the software that do not jive well with all systems. Functionality looks good, easy to use, and has a similarity to social media. Peer recognition capability is a good thing. Their integrity is highly lacking. Recognize has no integrity. We were working with them and planning to use them when a superior platform came to our attention -- one that, for very little more cost, provided not only a peer recognition platform but also a performance review and feedback platform and an amazingly robust employee engagement survey platform. The peer recognition platform of the superior company is virtually identical to Recognize in functionality. However, we paid for Recognize, prior to hearing about the other platform. But when we informed Recognize that we had changed our mind, we got ZERO refund. Not even partial. The ONLY work Recognize had done was create our company's page. We hadn't even loaded our users' names. Literally no implementation occurred. And not only did they refuse any refund, even partial, they completely ignored my calls, letters, and emails. Seven or eight months later, their sales guy sends me an email asking if I'd like to see a new demo?? Um, no. It's safe to say not only will Recognize never get any business from me, no matter what company I'm with, but any time someone asks me about Recognize they will learn of Recognize's sleazy behavior. They made 100% profit on us and delivered literally nothing. great at making associates feel appreciated.We were having a tough time finding a recognition platform that was parallelled into the Yammer system so that our employees did not have to leave the current platform. But then we found Recognize, and it was everything we were looking for. Overall a great product. It has the most friendly staff and knowledgeable at that. We were having a tough time finding a recognition platform that was parallelled into the Yammer system so that our employees did not have to leave the current platform. But then we found Recognize, and it was everything we were looking for. Overall a great product. It has the most friendly staff and knowledgeable at that. The only downside is to use it inside Yammer we have to download a browser extension. But I can honestly say that that is the only con with this software. Really worth the time and investment to recognize employees. Ease of use, great feedback from employeesEasy to use and a great way to show others appreciation. Easy to use and a great way to show others appreciation. Recognize has competitive pricing for different company sizes. For large companies with thousands of employees it can get as low as $0.20/user/mo when paid annually. The highest price is $4/user/mo when paid monthly for companies under 50 people. 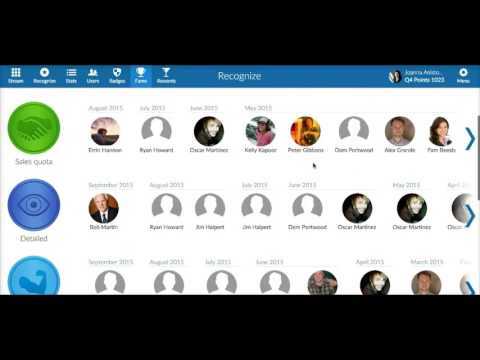 • Recognize supports integration with popular applications like Outlook, Yammer, Sharepoint, and Azure, allowing users to implement Recognize’s employment engagement platform within their current workflow. • Recognize facilitates Office 365, Yammer, Google Apps and Slack sign in, allowing users to login to Recognize automatically from their work account. • Available as a native mobile application for iOS and Android, Recognize affords users the flexibility to manage employee recognition activity on the move. • Recognize utilizes text message recognition, enabling employees to receive recognition conveniently through SMS text message. • Recognize employs staff leaderboards, granting users insight into the performance of individuals or teams with real-time statistics. Below are some frequently asked questions for Recognize. Q. What type of pricing plans does Recognize offer? Q. Who are the typical users of Recognize? Q. What languages does Recognize support? Q. Does Recognize support mobile devices? Q. Does Recognize offer an API? Yes, Recognize has an API available for use. Q. What other apps does Recognize integrate with? Q. What level of support does Recognize offer?